These chicks are most popular at Easter but also available all year long. From April 1-May 31 these colored chicks will be available for purchase. From May 1-September 30 we shipped these chicks once per month and you must be on our list in order to have these shipped to you as we do not color these chicks daily. The chicks will be straight run only and may be from Rhode Island Red or White Leghorn breeding stock. We color each chick by injecting the inside of the egg with a special dye during the incubation process. The chicks are not harmed during this process. 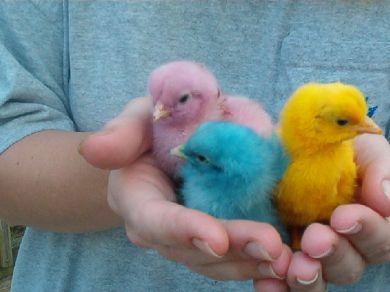 When the chicks hatch, they are whatever color we decided to make them. Colors range from blue,red,green,orange,purple,yellow and some may be neon colored which may glow in the dark! We spent years perfecting this process and our eggs come from the finest breeding stock only. All birds are NPIP and Avian clean. Please check your local and state laws before ordering. Chicks can only be shipped within the USA only. Sorry orders to Alaska and Hawaii will not be accepted. Chick colors will wear off once the feathers grow out on the birds, usually 3-4 weeks.